Oddly enough the iPad comes with more typefaces than the iPhone and iPod Touch. For the iPad Apple added quite a lot of fonts in the upgrade from iOS 3.2 to iOS 4.2. In the list below these new fonts are marked in italics. 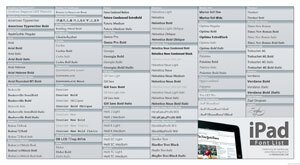 In total iOS 4.2.1 for the iPad ships with 174 fonts from 69 families. Click the image below to see a 500K PDF poster of all the fonts that shipped with iOS 3.2. It was created using Typefaces, a free app that lists all the fonts on an iPad and uses a customisable text to show off each typeface. Within the Apple iBook 1.1 app, users can select Baskerville, Cochin, Garamond, Palatino, Times New Roman and Verdana. In the Barnes & Noble eReader 2.1.3 app, choice is limited to Arial, Courier, Georgia, Helvetica, Marker Felt, Times New Roman, Trebuchet and Verdana. The Amazon Kindle 2.2 app uses a fixed typeface and only allows users to customize its size. I cannot read BENGALI Book in iBook soft which contain Sutonny MJ font in my iPhone 3GS…!!! Thanx for the font list. Now I can use Suitcase to create an iPad and iPod compatible font list for cross-device compatibility. Anyway, thanks for the lists. Exactly what developers need!